Yesterday, a dream partially came true. 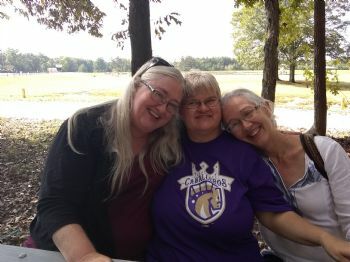 My two sisters closest in age to me were together and drove up to spend a few hours with me! The big deal? The last time we were together, they were in early grade school. Mother sent me to live with my dad. Long, very long, story short, we have not been together since that last day so long ago. Since then, we lost two siblings. My older brother died two weeks after that last day while saving another boy's life. One of our younger sisters died suddenly 2 years ago. I never thought I would never see them again. Our youngest sister wanted to join us but could not get the time off from work. But yesterday was all love, tears of joy, hugs and shared memories! I am still euphoric! WOW! What an emotional event this must have been for you! How wonderful that your sisters have been able to keep in touch with you, despite you being separated from each other all those years ago! How wonderful to see your siblings! Beautiful picture of the three of you, I hope you had an absolutely awesome time. Wow!!! That is incredible news! So glad you finally got to see your sisters! Sorry to hear of the unbreakable estrangement from your ailing Mother :-(( Its not your fault she chose to be mean. Just know you are a special person with a heart of gold who knows only love for others. And that is amazing!! Love those moments of togetherness always take massive photos!!! In spite of all you’ve gone through, you have an amazing attitude. So happy that you had these moments!